There are currently no commercial properties available to let on our site. Please contact us on 01484 866368 or email us at info@robertshaws.com for more information about commecial property we have available To Let and For Sale. If you wish to place a property with us For Sale or To Let please contact us on 01484 866368. 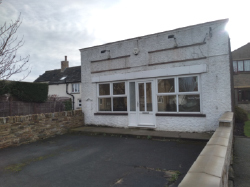 Small commercial unit to let with roadside frontage, off-road parking/tarmaced outdoor space to front Suitable for a variety of uses, subject to consents ideal for professional and retail sectors. The Property comprises a single story brick built and rendered building in the heart of Emley Village. The property has previously been used as a hairdressers for over 20 years, although it lends itself to a number of uses. The interior has been Newly Decorated and has UPVC windows and doors. There’s also private parking or outdoor space in front of the property. Please note the exterior is to be painted by the owner in the spring.